Christopher Reeve's teenage son paid tribute to his late mother and father at a celebrity charity gala in New York this week. 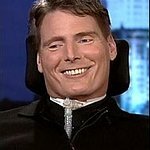 The Christopher and Dana Reeve Foundation was established by the Superman star and his wife to find treatments and cures for paralysis caused by spinal cord injury and other neurological disorders, and improve the quality of life for people living with disabilities. “To me, Mom and Dad were the people who forced me to eat broccoli and to turn the TV off to do my homework,” said 17-year-old Will Reeve, whose father died in 2004, and whose mother died in 2006. "I never consciously viewed them as inspirations then, but their heroic efforts shaped who I am today and who I hope to become tomorrow. “Some of my fondest memories of our family take place in our driveway, where I’m running around playing one sport or another. Dad’s watching me with a smile on his face the size of Texas, and Mom has her hands around Dad’s shoulders, letting go only to play fetch with our tennis ball-addict white Lab. The event was attended by stars such as Joan Collins and Meryl Streep.